The depletion of the public IPv4 address space has forced the internet community to think about alternative ways of addressing networked hosts. Network Address Translation (NAT) therefore was introduced to overcome these addressing problems that occurred with the rapid expansion of the Internet. Even if NAT was suggested as a temporary solution, it has been adopted by all network hardware manufacturers, and it is considered a very useful technology, not only for IP address conservation, but also for many other purposes including security. Basically NAT allows a single network device (e.g a router, firewall etc) to act as an agent between a private local area network and a public network such as the Internet. The purpose of this NAT device is to translate the source IP addresses of the internal network hosts into public routable IP addresses in order to communicate with the Internet. Networks can now use the RFC 1918 private address space internally and still have a way to access the Internet using NAT. 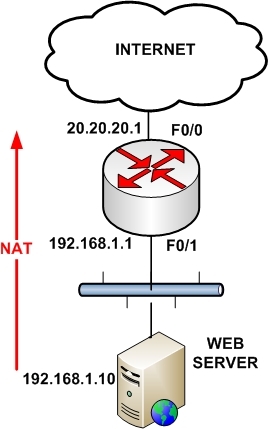 NAT increases security by hiding the internal network topology and addressing scheme. Cisco IOS routers support different types of NAT as will be explained below. NAT has many forms and can work in several ways, but in this post I will explain the most important types of NAT. This is the most frequently used form of NAT in IP networks. It uses the concept of “many-to-one” translation where multiple connections from different internal hosts are “multiplexed” into a single registered (public) IP address using different source port numbers. This type of NAT allows a maximum of 65,536 internal connections to be translated into a single public IP. This type of NAT is very useful in situations where our ISP has assigned us only a single public IP address, as shown on the diagram below. All IP addresses of the LAN network (192.168.1.0/24) will be translated using the public IP of the router (20.20.20.1). NAT can be performed both statically and dynamically. Static NAT simply maps one private IP address to a single public IP address, and this is the flavor of NAT we are discussing in this section. A Cisco router performing NAT divides its universe into the inside and the outside. Typically the inside is a private enterprise, and the outside is the public Internet. In addition to the notion of inside and outside, a Cisco NAT router classifies addresses as either local or global. Inside local addresses are assigned to inside devices. These addresses are not advertised to the outside. Inside global are addresses by which inside devices are known to the outside. Outside local are addresses by which outside devices are known to the inside. Outside global addresses are assigned to outside devices. These addresses are not advertised to the inside. You probably know very well how to configure IP addresses on router interfaces, so we skip those configuration steps and move straight to the interesting stuff. First, we have to assign Fa0/0 as NAT inside interface and Fa0/1 as NAT outside interface on R1. This would tell the router that interesting traffic entering or exiting these two interfaces will be subject to address translation. Here, we are telling the router to perform NAT on packets coming into the router on the inside interface Fa0/0. More specifically the router would identify which of these packets have a source IP address of 192.168.1.2 and would change it to 89.203.12.47 before forwarding the packet out the outside interface Fa0/1. Similarly, return packets coming in at outside interface Fa0/1 would undergo translation of destination IP address. Let’s now verify if NAT is actually working as it is supposed to work. There are a couple of very useful Cisco IOS commands that can be used to do just that. Command show ip nat statistics displays the number of static and dynamic NAT translations, inside and outside interfaces, and the number of hits and misses. Command show ip nat translations displays the IP addresses for NAT translations. As you see in the above output, we have one NAT entry configured with Inside global address 89.203.12.47 and Inside local address 192.168.1.2 specified. Outside local and Outside global addresses are blank because our NAT configuration does not change those addresses. Let’s now go to the PC and ping the Server before running the command show ip nat translations again to see if it makes any difference. As you can see in the above output, NAT is active as manifested by the appearance of an additional dynamic entry for ICMP protocol and some additional hits, corresponding to our ping attempt from PC to Server. 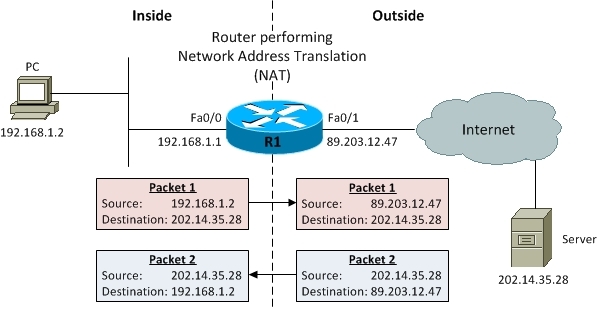 We just configured and verified a simple NAT scenario translating only the source or destination (not both at the same time) IP addresses of packets moving between inside and outside interfaces. This sort of NAT configuration is called static NAT as a single inside local IP address is statically mapped to a single outside local IP address. Another important feature of NAT is static Port Address Translation (PAT). Static PAT is designed to allow one-to-one mapping between local and global addresses. A common use of static PAT is to allow Internet users from the public network to access a Web server located in the private network. This configuration line performs the static address translation for the Web server. With this configuration line, users that try to reach 89.203.12.47 port 80 (www) are automatically redirected to 192.168.1.2 port 80 (www). In our case, 192.168.1.2 is the IP address of the PC which is also the Web server. This configuration can be verified using the same two NAT verification commands: show ip nat translations and show ip nat statistics. Notice that the address 89.203.12.47 with port number 80 (HTTP) translates to 192.168.1.2 port 80, and vice versa. Therefore, Internet users can browse the Web server even though the Web server is on a private network with a private IP address.